Italians are great at sculpting lines. We see it in their clothes, in their cars and in their yachts. This MCY 86 is no exception. Since Monte Carlo Yachtsâ€™ inception in 2008, the manufacturer has grown exponentially through the direction of their President, Carla Demaria. Now with its recently launched 86 in Asia, this trend continues. Five different layouts are available, offering the ultimate usable space indoors and outdoors. When itâ€™s time to head outdoors for some fun in the sun, the Portuguese deck has an inviting living space ideal for comfy sofas and large sun-loungers. Thereâ€™s even a table for dining with friends and family and the ability to attach a canopy overhead. The main deck offers a remarkable blend of style and practicality. Large windows and sliding glass doors let a lot of light into the saloon and dining area. As you step rearward out onto the wooden aft-deck, thereâ€™s a custimasable space for dinner, drinks and relaxing. The table design allows for dining or entertaining guests for cocktails. As you walk along the sides of the MCY 86, you notice that both sides have an electronic balcony that can be lowered. A perfect space to admire the view. If swimming is your thing, thereâ€™s a hydraulic swim platform which also doubles to accommodate a large tender or some jet skis. Thereâ€™s also a tender garage. As you wouldÂ expect in such a premium yacht, when we move inside, the quality of materials, fabrics and accessories available is impressive. Volterra andÂ hand-made Venetian Murano glass adorn the cabins while fabrics and accessories from brands such as Armani and Hermes add timeless style to thisÂ Italian beauty. The flybridge can feature a few different layouts and thanks to a spacious design, accommodates plenty of sofa space and a hot tub thatâ€™s great for parties or healing, after a little too much time spent in the sun. Thereâ€™s also a wet bar, open air kitchen and an overhead made of carbonÂ fibre. The MCY 86 allows for a lot of privacy onboard. In one example, the main cabin at the aft has a private stairway leading to the suite, while theÂ midship stateroom and twin bed cabin share another stairway. You can also rearrange the layout to have up to five well sized staterooms. The crewâ€™sÂ cabins are located further forward in the bow. 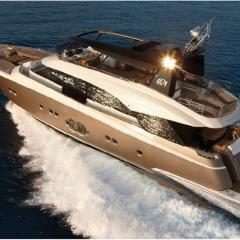 With Monte Carlo Yachts, the interiors are built outside of the yacht, thus allowing for a lot of designÂ customisation. At 86 feet and 72 tons, this is a large yacht, however with its twin Man V12 engines, itâ€™s able to cut through the water with incredible speed. Topping out at 29 knots with an impressive cruise of 24 knots, owners will be happy with how quickly they can get from one destination toÂ another.